This could be the start of a sad story about the dying craft of fine custom furniture. It is, after all, an industry more and more dominated by online sales, overseas fabrication, and manufactured materials. But it’s not a dying craft for Mark Meulebroeck of Red Miter Furniture. He’s confident that the art of fine woodworking will always have a place in people’s homes. Determined to be a teller of that better-kind of story, he opens the doors to his workshop each day and strikes a balance between style and materials, form and function, in the new era of custom furniture. After the design process, Mark gets to work. “I’ve always been drawn to the meticulous nature of fine woodworking. 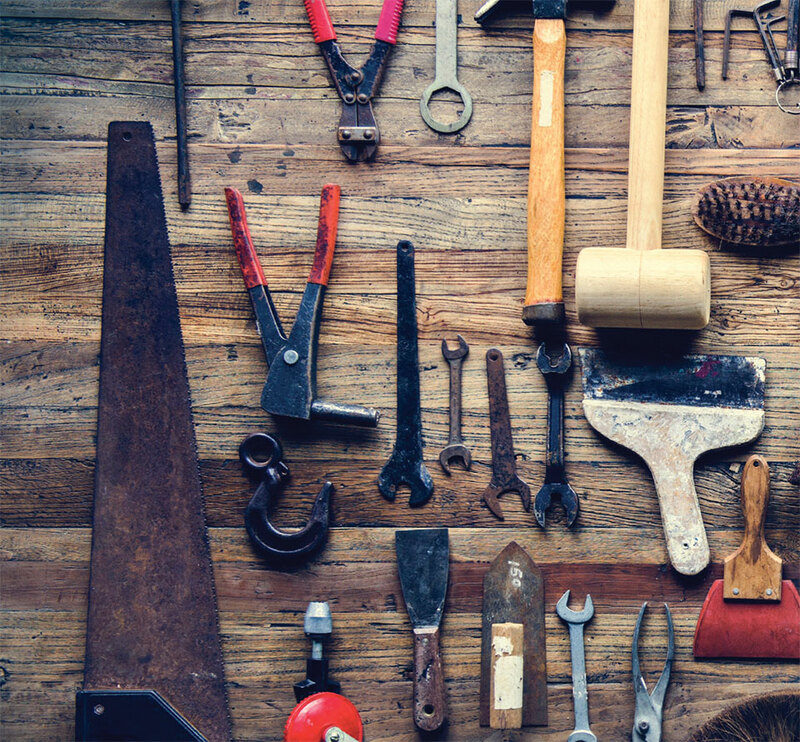 Since my first shop class in high school, I just couldn’t get enough,” he says. 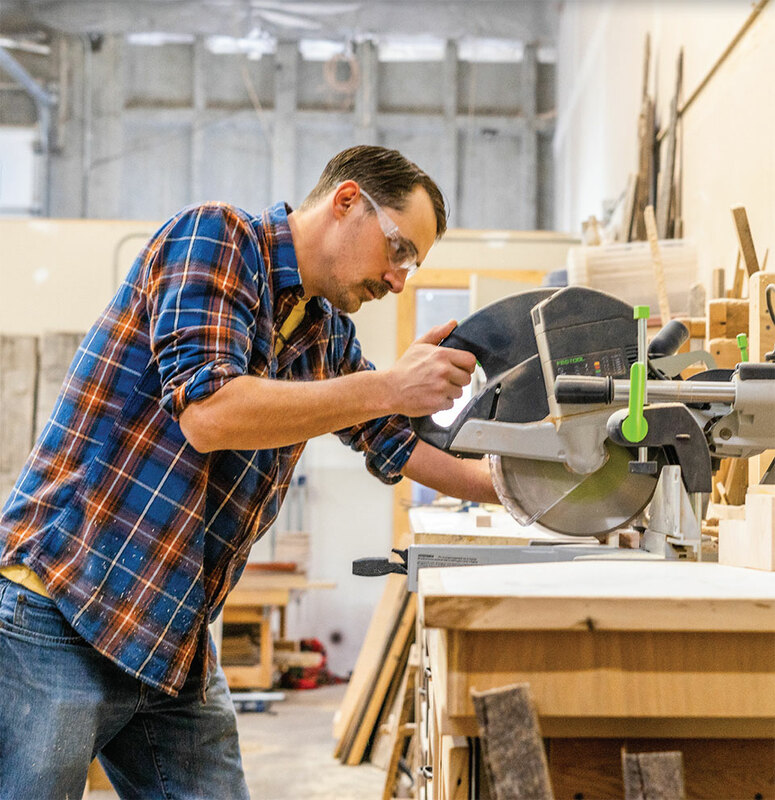 With his family in the construction business in Minnesota, Mark had opportunities for hands-on building experience there, but the draw of a high-altitude lifestyle brought him to Bend’s mountain scene after he earned a degree in furniture and cabinet making. When Mark made the move to Oregon, he brought a semi-load of reclaimed lumber, salvaged from barn structures and farmsteads near his Minnesota hometown. Working in a refined-reclaimed style has naturally followed for Red Miter Furniture. Of reclaimed products, Mark says, “The wood provides a lot of inspiration—its rustic nature and the material’s history can make it particularly meaningful.” Among his stock of reclaimed, he has a few favorites that he has held on to, waiting for the right projects. A small stack of wood from a turn-of-the-century smokehouse is a personal favorite in his collection. “The wood smells like the best barbecue you’ve ever had, and it has so much character,” says Mark. Though he’s not sure what project it will be used for, he’s sure to be hungry the entire time he works with it. 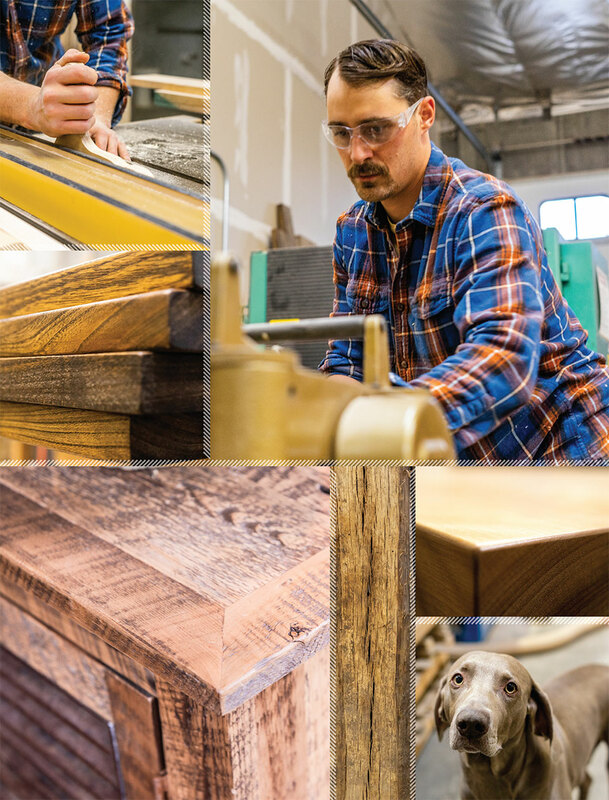 Whether working with reclaimed materials or new hardwoods, Mark’s focus centers around creating balance within the design and showcasing the wood in its best form. This balance can be seen in his mix of rustic materials with contemporary design, or through the play between wood and metal, adding movement and depth. New hardwoods are free from the design limitations that can come with reclaimed wood. Mark says, “Working with new hardwoods opens up the design potential in a way that reclaimed materials sometimes cannot.” He’s played around with many styles as his craft has evolved—everything from curved bar tops to period-inspired, to mid-century modern pieces. For a recent custom table in a Bend area design studio, his client wanted something that referenced French design, with a balance of curved and straight lines. Mark chose new birch for its durability, its light honeyed tone, and grain pattern. He turned the square legs with a double cove profile and topped them with corbels set below the table top. The result is both welcoming and timeless. “When I build furniture, I envision each piece as an heirloom—something that will stay with the client for years and a piece around which they will create memories,” says Mark. Ultimately, this is the story Red Miter is writing in the new era of custom furniture—to not only create beautiful furniture but to create something lasting. Skilled, intelligent, respected, clever, doing-it-right. In much the same way that the word “aloha” has many applications, the Hawaiian word “akamai” takes on these multiple meanings depending upon the context in which it is used. For Mike and Sue Spring, all these definitions fit their vision for a custom cabinetry and furniture shop when they moved their family from the Big Island to Bend nearly 25 years ago. 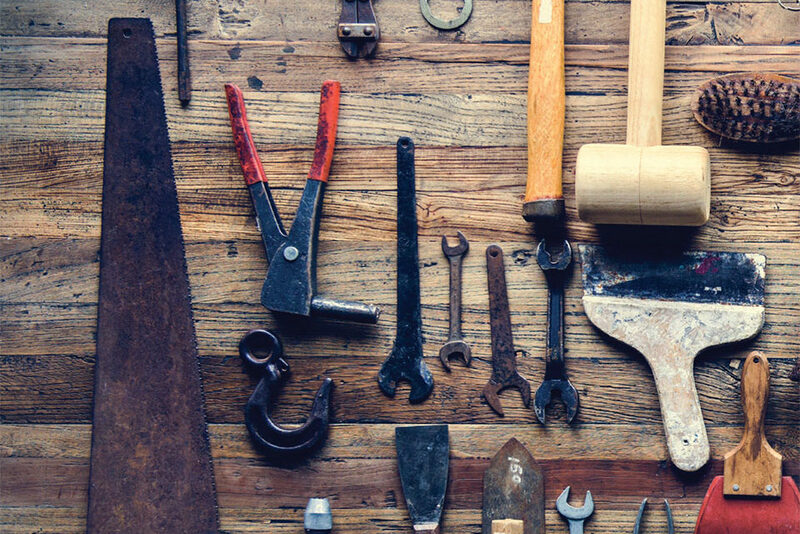 They folded the spirit of akamai into Mike’s years of building industry knowledge when they opened Akamai Woodworks, and have been providing that skilled, respected, doing-it-right experience for their clients ever since. After initially making a name for themselves through multiple custom golf clubhouse and pro-shop designs and installations, Mike transitioned his eye for custom design that melds precise function with impeccable styling into a wide variety of residential and commercial projects. Today, their focus is in custom cabinetry for residential and commercial projects, as well as hand-crafted furniture. The Akamai design team takes on a wide range of styles, from rustic Americana to European-influenced contemporary. 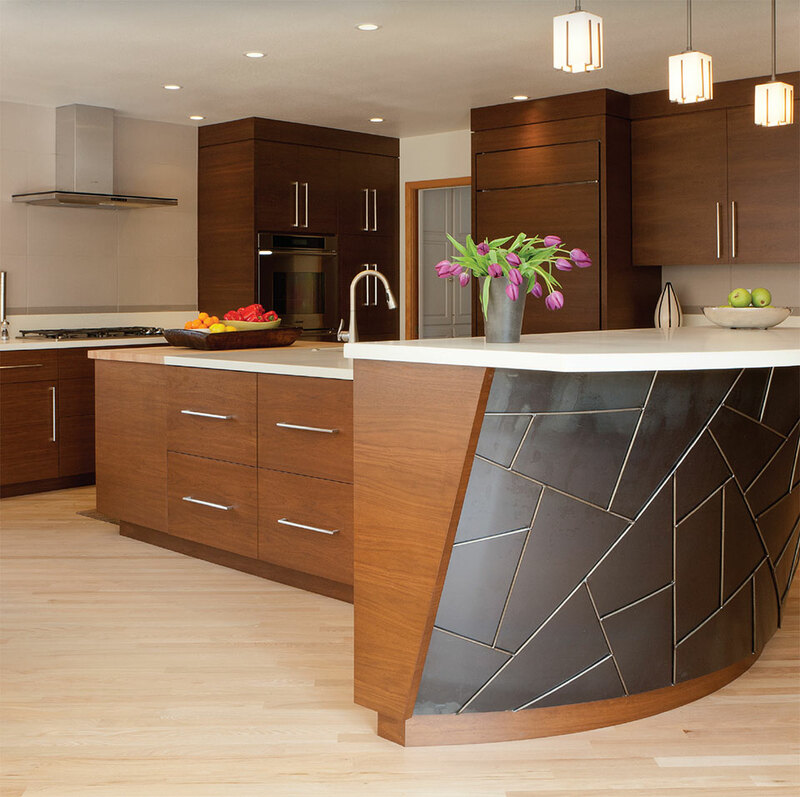 Of the evolution in cabinetry styles they’ve seen over the years, Sue says, “While we still do a fair amount of solid hardwood, stained kitchens, the trends we see now also include sleek veneers and painted cabinetry. Often, the contrast of two materials is an important design element—white cabinets with a warm wood island or the addition of steel or other elements into our woodwork.” In a recent Akamai kitchen, this contrast takes the shape of white Shaker-style cabinetry that creates a modern farmhouse backdrop with a large, grey-hued island. Beyond the kitchen, custom bathroom vanities and built-in fixtures showcase the beauty of Akamai’s wood fabrication. In one home, a floating oak bathroom vanity is finished in a cerused-style, with a white rub-through finish on a dark stain treatment. The result is striking color contrast within the wood that highlights movement in grain pattern. In another home, a full wall adjacent to a steel-wrapped fireplace is clad in warm-toned veneer by Akamai’s craftsmen. Outside of the showroom, Akamai is often hands-on at job sites, working closely with builders and designers. For some projects, Mike puts his decades of building industry experience to work, acting as general contractor. “It certainly can go beyond cabinets and furniture here. If a project is a right fit, we have the capability to manage everything from demolition of existing spaces to design, fabrication, and installation of a project,” he says. 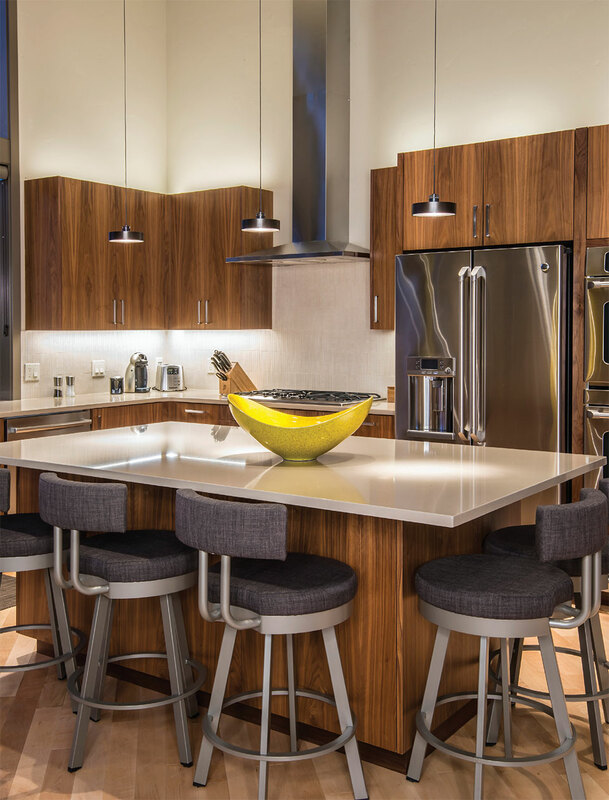 For rooms that don’t need cabinetry or built-in fabrications, Akamai’s furniture capabilities give homeowners endless options for custom, eye-catching design befitting their surroundings. Sue says, “Clients often come to us with a piece of furniture in mind, but they are unable to find it in the size that fits their space. We’re capable of creating in a variety of styles to meet the exact size specifications of our clients.” In a recent mountain-modern living room collaboration, the Akamai team worked with a Portland designer to create a myrtlewood seating set, with striking dovetail joinery, that fits the space better than any mass-produced piece could. The experience earned through 25 years in the industry has taught Mike and Sue that demands and styles shift over time. With those changes, they continually look to what is next in timber design trends and creative collaborations. But they know that a couple things will never change for their team—dedication to service and skilled craftsmanship. This, they say, is the “akamai” way. America is in love with the barn. So much of what we look to in contemporary design is informed by principles first applied to barn construction: wide-open spaces, exposed structural timbers, and design driven by purpose, to name just a few. The vernacular of the American barn now takes form in spaces far removed from livestock or equine purposes. No business understands this convergence of the pastoral with emerging home design better than DC Builders. Their start was in barn construction, so DC’s ever-growing list of residential and commercial projects meld the best of barn elements with current building trends. And while much of their work is done in post-and-beam construction with timber—the oldest and most tested of building materials—their use of technology puts them at the forefront of new building techniques. It’s in this space between the old and new—barn and contemporary, traditional materials and new technologies—where DC Builders creates homes that can, at once, nod to the past while leaning into the future. DC Builders’ founders, Dustin Gruetter and Cole Hansen, along with long-time project coordinator Bret Loftis, began as young entrepreneurs, building pole-barn kits for clients around the country. They quickly found that many of their clients were looking for more customized solutions to meet particular needs or site specifications. As Bret explains, “Many of our clients in those early years were working from a kit that almost worked for them, but not quite. They wanted customizations that allowed their barn to serve multiple purposes.” Recognizing this, DC worked to better the entire process of barn-building, creating truly custom spaces that can function not just for farm life, but for human needs, as well. 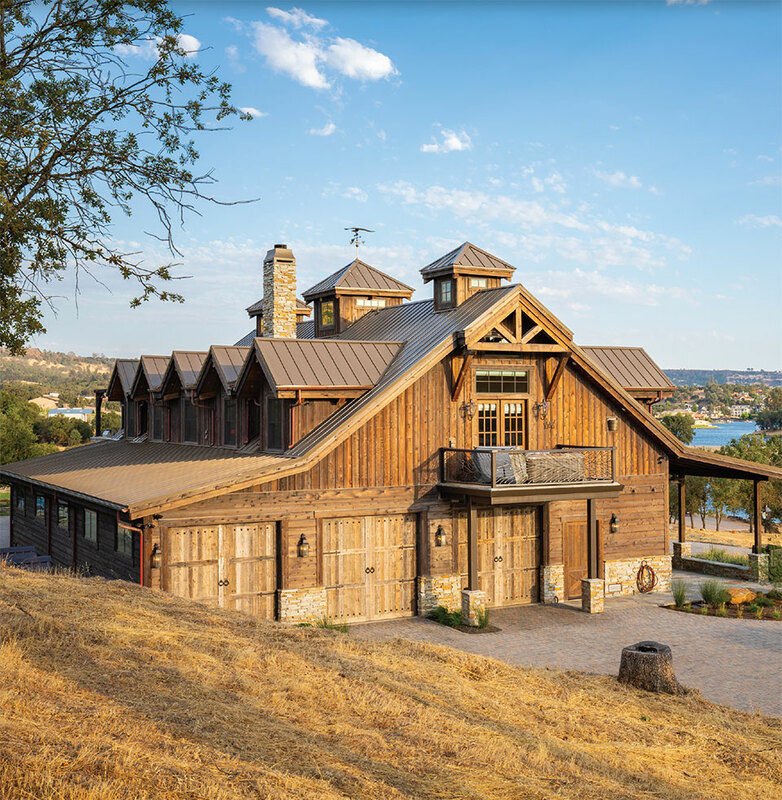 Today, they have parlayed their custom building experience into everything from high-end residential homes to large event spaces, cozy guest cottages, and winery tasting rooms. In one Bend area home, a cedar-clad, barn-style home serves the dual purpose of a multi-use garage below with two-bedroom, two-bathroom living quarters above. The homeowners wanted space to store their R.V. and recreational equipment with the added upstairs luxury of open-concept living and plenty of covered outdoor space to enjoy the high desert throughout the year. With the requirement of high ceilings and large doors on the ground level, the scale of the home is given character and a human dimension through the use of multiple dormers, gables, and Douglas fir trusses. This careful balance between scale and character is seen throughout DC’s work. “We’ve built some large structures,” says Bret. “So we understand the importance of making a big space feel warm and intimate as well.” DC manages to accomplish this through both material and technology. Bret explains, “The nature of our timber construction—exposed beams, gables, and knee bracing—lends character to spaces. We also design everything we build with three-dimensional programming. Not every homeowner can look at a traditional 2D floor plan on paper and understand how that translates into the final space. But our design allows clients to do a virtual walk-through of a complete 3D computer rendering before we’ve even broken ground. This allows homeowners to feel the scale and function of their home, and we can make adjustments early on if needed, instead of halfway through a project on site.” The result of this process is two-fold: confident, happy clients and less time and money spent on change orders. The technological component to DC’s work also includes a web-based interface connecting the client to the designer, builder, and all subcontractors. Daily updates on progress keep the project moving and ensure smooth communication. And almost all of the timber used for framing their custom homes is cut, fabricated, and drilled off-site. Bret says, “We take the 3D design and cut our lumber directly from that plan off-site. This means there is zero chance for mistakes, less waste, and incredibly fast construction times.” Some of their homes are framed within two weeks using this efficient method. Throughout DC’s portfolio, timber is a prevalent design element. Their use of primarily Douglas fir and cedar, which are indigenous to the area, create structures that relate to their natural surroundings, while other hardwoods and reclaimed or faux-reclaimed materials are used to accent individual spaces. With the majority of their wood coming directly from the Pacific Northwest, Bret highlights the important collaborations they have with the timber industry. “By cultivating relationships directly with mills, we can control our lumber quality, developing our own high standard for the lumber we receive,” he says. For DC’s clients, that means the absolute best quality without a premium price. “When we started 15 years ago, a lot of clients would ask us if we inherited the business from our parents. That’s how young we were,” Bret recalls with a laugh. “In truth, that’s always been a compliment to us, and an opportunity to prove ourselves time and again. So yes, we’re comparatively young in this industry, but with that comes our unique ability to develop more effective methods. 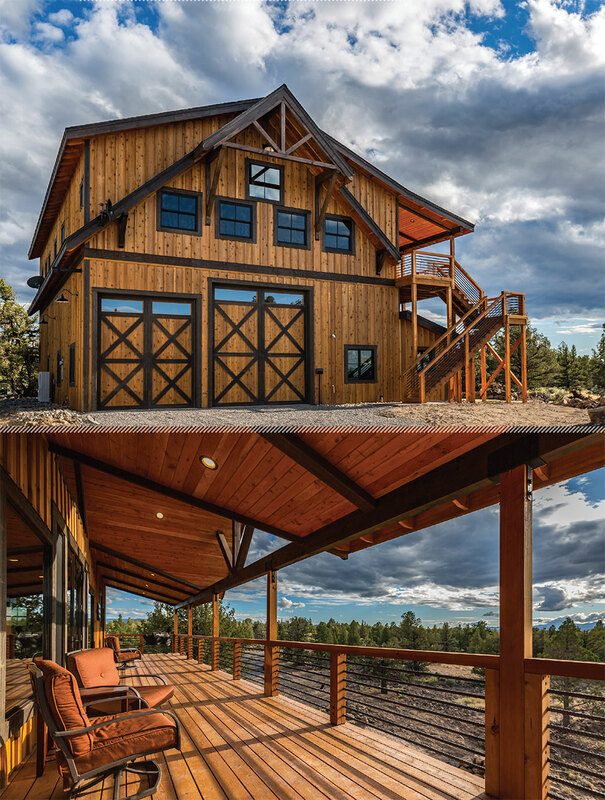 Applying new technology to one of the oldest building methods is really what excites us.” DC Builders has come a long way from the days of pole-barn kit construction, known now for their custom building projects around the country. The evolution of their design still reflects the tradition of barn construction to a certain degree, but it’s their efficient, tech-driven processes that reflect their forward thinking.